Prohibition began in the United States when the Eighteenth Amendment, which banned the production, transfer and sale of intoxicating beverages, came into effect on January 17, 1920, and it was repealed on December 5, 1933. The United States would be transformed during those thirteen years. The law was unpopular from the beginning, and speakeasies, illegal bars, quickly sprung up across the nation. The Prohibition Bureau, which had been formed to enforce Prohibition, soon became riddled with corruption. Before Prohibition, criminals had operated small gangs, limited to extortion, gambling and prostitution, and squabbling over neighborhoods, but bootlegging offered wealth beyond their wildest dreams. 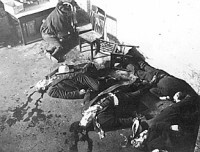 Despite the huge wealth, the gangs fought vicious wars over territory, until the more organized, ruthless gangsters formed a national network that would spread its tentacles across the nation by the time Prohibition was finally repealed. Here is a timeline to help understand it.